A technique more commonly used to diagnose medical problems with humans is being used for pets in south Wales. A mobile MRI scanner visits Bridge Veterinary Group in Pontllanfraith, Caerphilly county once a month. The scans, which cost about £1,000, use a magnetic field to produce a detailed image of part of the animal's body. Burgess Diagnostics, a company in Preston which owns four scanners across the UK, has previously carried out scans on lions and a shark. 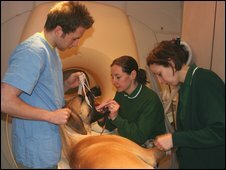 Bridge Veterinary Group partner Graham Blow said MRI (magnetic resonance imaging) scans on pets made a "big difference" to diagnosing problems. "We had a dog in there with severe neck pain and we had done tests but what was diagnosed probably wouldn't have been possible without MRI," he said. "Sometimes you might look and see something is inoperable and you wouldn't put the animal through an operation. It can alleviate unnecessary suffering in that case." Previously, animals in south Wales requiring an MRI scan would have been taken over the border to England. But now vets from around the area can send pet owners to the scanner when it makes one of its regular visits to the Bridge surgery's car park. "A lot of people don't like travelling with the animals," said Mr Blow. "We had one last month with a suspected brain tumour and you wouldn't want to travel with an animal like that. It puts the owners' minds at rest." The cost including the anaesthetic, scan and reports is usually around £1,000, with the vast majority of customers footing the bill through insurance. Mr Blow said the scans, which take about 30 to 40 minutes, were safer than other procedures used for diagnosis and gave "phenomenal detail". Burgess Diagnostics has four scanners for animals, which cost "anything from £800,000 to £1m" each, said managing director Derek Hughes. "We've been to several of the zoos and safari parks and scanned lions, chimps, gorillas, monkeys and we've done a shark. The bulk of the work is small animals like cats and dogs," he said. "It's grown from having one scanner four years ago to four scanners now."